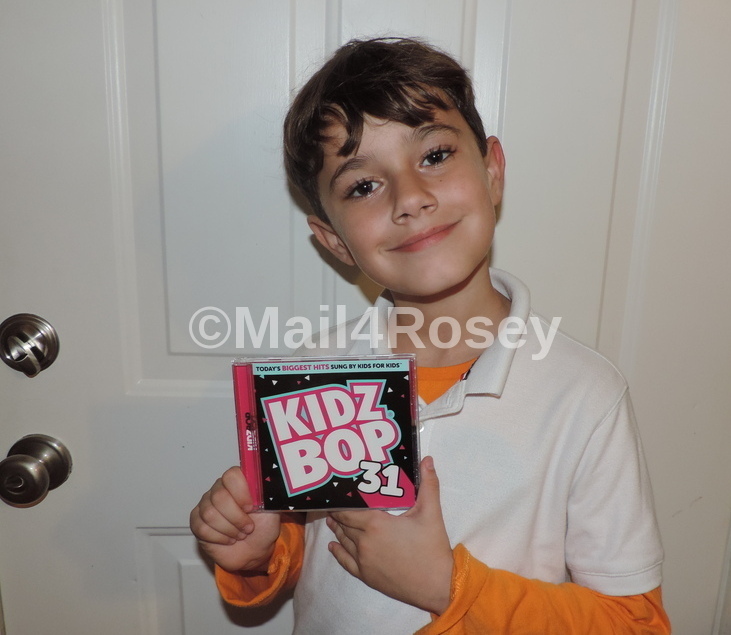 Mail4Rosey: Kidz Bop: Pop Music Sung by Kids_for Kids! The lastest Kidz Bop CD is #31. It is jam-packed full of good songs, modern pop hits of today with a twist. What's the twist? It's kids singing and it's family-friendly which means no *bleeps* or words you wish would be bleeped are going to come out of the speakers. Like I said, my son is 8, so that's important to me. Plus it's fun to hear the kids singing the songs. You can visit the song list and hear excerpts by visiting here. You can also follow Kidz Bop of Facebook and/or Twitter. Have you heard of Kidz Bop? Do you like them? Or if you haven't heard of them, do you like the concept? Oh this would be a perfect gift for a certain little girl I know, thanks for the heads up! No bleeps are good for the kiddos indeed. I agree, too much music out there is definitely no for little ears. This is a great solution. How fun. Now you've made me remember doing the same thing when I was a kid. I so remember that. Oh yes, we love these in our house, too. I love that the lyrics are family-friendly. Kidz Bop CDs are always a blast. They always have the most recent hits! My son was JUST standing here beside me sifting through our cds trying to find something to listen to. I'm going to have to invest in some kidzbop! I feel old. Wow do I ever feel old! I remember when the first one came out..totally didn't think they would still be making these but apparently they are! My 3 year old grandson just loves music....he is singing and dancing all the time. I might have to find these for him. These would make a good birthday gift. I must keep them in mind. I agree with Heather here. I feel old as well. But they seems to be great for younger kids. I know if my step son was younger I'd probably get him something like this. Sounds like a fun collection of songs for kids to enjoy. What a nice mix of different types of music too! Kidzbop is truly a great way for children to listen to current music safely and still enjoy the songs as if they were the originals. Exposing kids to music is great! It's one of the best things we can share with them! My boys are obsessed with music! I need to get them this CD they would love it. My kids love this CD. We see the commercials all the time and they dance along. My son loves the kidz bop cds! We have what feels like a million of them. I don't think I've ever listened to any of the Kidz Bop music before but I've seen the commercials on TV. BTW your son looks like he shot up overnight. Wow! These are good clean versions of these songs. Perfect for kids. Gosh this is a throw back for me. I remember my newphews being into KIDZ BOP when they were little. I used to love the Mini Pops when i was younger. I will have to check this out. I bet my kids would love it. I think my kids were around for kidz bop 1-10. They loved them all, I guess that's why the brand has endured. Wow I feel so old! I remember singing along to this. I think this is something the girls would love. I will check this out for them. My son loves Kidz Bop! We always have to get the latest one! I'm sure my boys would like these. Kidz Bop always puts me in a good mood! I haven't heard about Kidz Bop. All my children are adults now and my grandson is only 7 weeks old. I will share this post with my sister and cousins. They have little kids and they love to go on road trips. They'd surely enjoy listening to these songs. I like kids bop. I listened to it when I was younger though if I remember correctly there was just dead air where the bad word would be. A great gift for music kid. I love their commercials. We don't have any Kidz Bop Pop Music. My boys are odd and like old school groups and singers. My kids loved this. I will check this out for my grand kids. This is so cool and inspiring! My son loves to sing so this would be a wonderful gift. These cd's are a real hit with kids! My 6 year old niece had this at the top of her birthday list this year! My little one loves the Kidz Bop version of pop songs. We like it that we don't have to worry about the lyrics. My daughter loves Kidz Bop! I remember these from when I was a kid! It's a great idea for little ones for sure! Such a great CD to keep in hand for the little ones of the house! Wow, Kidz Bop CDs have been around for a very long time! I can't believe they are already up to number 31! Your son looks super happy to have it.